Plug DC jack 5,5 outer, 2,1 mm inner size. Connect 12-15V DC power voltage. Current dependency to connected antenna switch, alone controller about 60mA. MENU - light button. For activate press button more than 0,5 second. Green light signals if manual control activate. ENCODER - rotary encoder primary move cursor, after activate MENU you can select antenna outputs manual or back activate BCD inputs. DC POWER - input jack 5,5/2,1 mm size for DC power between 12-14 Volts. Same Power on pin8 ANT outputs. ETHERNET - OPTIONAL module for controlled switch manual over simple web page. PTT PA - PTT continues from TRX to this output for power amplifier. 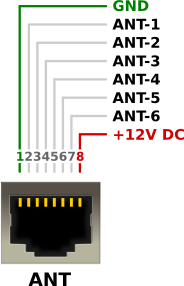 If detect collision between inputs band, this output will be deactivate. ANT - six outputs, will be in two levels dependency to preset JP1 and JP2 jumper. Also 12V DC power and ground available. UDN if use internal source 12V power driver UDN2580A. From the left side is accessible USB mini connector from Arduino NANO, which is usable for upload new firmware. two on rear side, near double cinch. 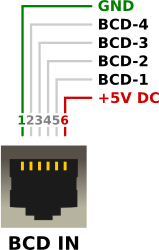 JP8 to HIGH - activate BCD inputs with TTL signal level (1k ohm pull-down resistor). JP8 to LOW - activate BCD inputs to ground (1k ohm pull up resistor). This jumper must be set dependency to used U4 and U7 IO chip - do not change before change chip! ULN - for ULN2803A open collector driver - switching antenna relay with grounded outputs. UDN - for UDN2580A source 12V power driver - switching antenna relay with 12V power outputs. PTT TRX - input PTT cinch from transceiver (grounding activate). PTT PA - output PTT cinch to power amplifier - if controller detect collision, disconnect signal from transceiver PTT. 12V - DC Power input (positive center) 12-14V. Same Power on pin8 ANT outputs. Band decoder settup is performed via firmware source code. It is compile and upload to device with Arduino GUI. Connect mini USB connector on left side enclosure. Download source code and open in GUI. Inputs level - changing inputs level also need set JP8 jumper. Before opening enclosure has to be removed eight screws (three on left side, three on right side, two on rear side). Ethernet - before enable in firmware need open enclosure and instal optional module USR-ES1. Set the last two lines (value between 0 to 6) how outputs represent BCD input value. This example activate non WARC bands.